The key Senate vote that halted gun control legislation last week is drawing a mixed reaction from the American public: 47% express negative feelings about the vote while 39% have a positive reaction to the Senate’s rejection of gun control legislation that included background checks on gun purchases. Overall, 15% say they are angry this legislation was voted down and 32% say they are disappointed. On the other side, 20% say are very happy the legislation was blocked, while 19% say they are relieved. The new national survey by the Pew Research Center and the Washington Post, conducted April 18-21 among 1,002 adults, finds a wide partisan gap in reactions. Just over half of Republicans are either very happy (29%) or relieved (23%) that the legislation was voted down, though roughly a third of Republicans say they are either disappointed (26%) or angry (8%). Among Democrats, fully two-thirds (67%) express negative sentiments about the legislation’s failure, with more saying they are disappointed (41%) than angry (26%). Republicans and Democrats paid equally close attention to the gun debate last week: 40% across party lines say they tracked the events very closely, making it the second most closely followed story last week, after the terrorist bombings at the Boston Marathon. About half of those who followed news about the gun control debate very closely last week had particularly strong reactions to the Senate vote – 31% say they are very happy about the outcome while 22% are angry. Among those who followed news about the debate less closely, only about a quarter offered such strong reactions. 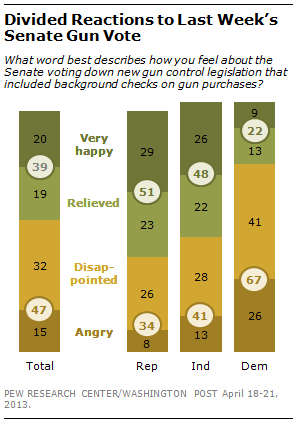 The overall balance of positive and negative reactions to the Senate vote tracks more closely to earlier measures of the public’s broad views on gun control than to attitudes toward background checks specifically. A Pew Research Center/USA TODAY survey in February found the public divided over whether gun control (50%) or gun rights (46%) should be the higher priority. By contrast, making private gun sales and sales at gun shows subject to background checks was supported by an 83% to 15% margin in the February survey. Despite stark political divisions in the Senate over the Toomey-Manchin legislation, there are relatively modest differences in public reactions in states represented by senators on both sides of the vote. Even in states where both senators voted in favor of the legislation, only about half of the constituents are angry or disappointed that the proposal failed. 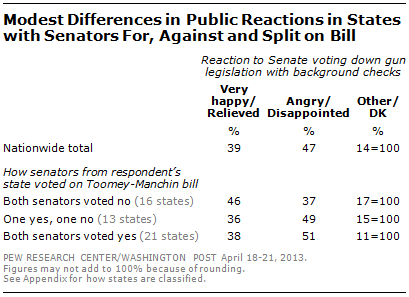 Similarly, in states where both members voted no only about half are very happy or relieved the bill was blocked. In the 21 states where both senators supported the legislation, including California, New York and Illinois, 51% say they are either angry or disappointed that the legislation failed, while 38% are very happy or relieved about the outcome. Just 16% of people in these states say they are angry the legislation was voted down, while 35% are simply disappointed. In the 13 states where one senator voted in favor and one voted against the bill, such as Florida, Ohio and Arizona, the overall balance of opinion is similar: 49% say they are angry or disappointed, 36% very happy or relieved. Reactions to the Senate vote are more positive in states represented by two senators who both voted against the legislation. In the 16 states where both senators voted against the legislation, such as Texas, Georgia and Tennessee, 46% say they are very happy or relieved that the bill did not pass; 37% say they are angry or disappointed. * Sen. Harry Reid (D-NV) originally voted yes, but then changed his vote to no so that he could reintroduce the proposal at a later time. For this analysis, Sen. Reid is considered a yes vote.